Senior Josh Grazul works on his hops farm Sept. 8. A long, green vinyl banner hangs on a red barn in Freeville, N.Y. The banner is the only separation between this barn and a dozen other barns in the town located 12 miles outside Ithaca. But this particular farm is nothing like the others. On a sunny, fall afternoon, senior Josh Grazul pulls a 70-year-old, red Ford tractor in between two of the rows of crops planted behind the barn. The noisy diesel engine sputters and comes to a halt. Grazul, tall and broad shouldered, hops off the tractor and walks toward one of the vines hanging from a wire connecting tall telephone poles. He bends down and grabs one of the flowering plants on the vine. He flips up the brim of his fisherman’s hat and plucks a soft, green pinecone-shaped bud from the plant. Squeezing the bud gently, he sniffs it and smiles. “There’s nothing like the smell of fresh-picked hops,” he said. This farm is home to the Rhizome Republic, the hops farm and distribution company of which Grazul is the owner and creator. 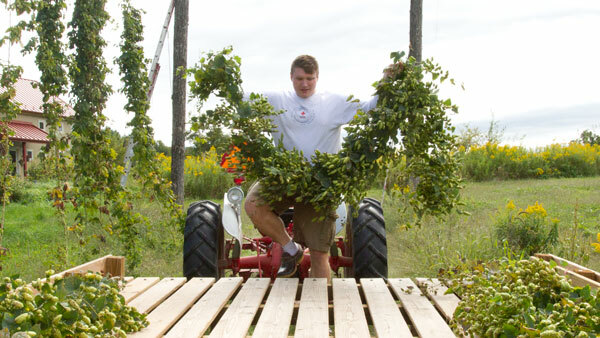 Since he began growing hops just two years ago, Grazul has become a preeminent hops provider in the area. Through shrewd carpentry and farming, tireless hours and unbridled devotion for the hops, Grazul has transformed a dingy attic into a hops dryer, a rake and handmade pulleys into a vine processor, a pond into a personal irrigation system and a two plant operation into more than 2,000 plants, worth more than $270,000. Recently, Grazul teamed up with Lars Mudrak, head brewer at Ithaca’s own Bandwagon Brew Pub, providing hops on its new Harvest Ale, a beer that debuted at the bar Wednesday. Grazul was raised in Freeville and attended Tompkins Cortland Community College after high school, earning an associate degree in sciences before enrolling at Ithaca College. After a couple months as a business major, Grazul’s father urged him to put his knowledge into action. The appeal came with a caveat. More than 170,000 small businesses nationwide between 2009 and 2010 were affected by the recent recession, and his father urged him to be smart in his business decision with that in mind. It didn’t take Grazul long to think of something that fit the bill. Grazul said he thought back to a beverage tasting course class that he took toward the end of his TC3 career. The class mostly focused on wine, but the finicky nature of grapes and cost associated with vineyards ruled out a vino venture. Grazul had always been a beer lover and cherished his German heritage — one heavily entrenched in brewing history — so he decided to open up a hops farm. He immersed himself in the biology, maintenance, culture and history of the plant and got in touch with other growers in the area to learn as much as he could. There were many benefits of opening up a hops farm in Central New York, which has a strong history as being one of the main hops-providing areas in the country. Because hops thrive in moist, temperate climates, Central New York is an ideal place for the buds to grow. According to the Northeast Hop Alliance, the fertile soils surrounding the Mohawk River Valley provided 80 percent of America’s hops in the mid-1800s. In 2012, Govenor Andrew Cuomo signed legislation that will provide tax breaks for New York state breweries. It also mandates that every beer labeled a “New York Beer” eventually must be made with at least 90 percent state-grown ingredients. With the new laws in place, the demand for New York hops has skyrocketed. A thick India Pale Ale may take a full pound of hops for each 10-gallon batch. New York state is home to more than 100 breweries that produced more than 22 million gallons of beer in 2012. This level of production requires a high volume of hops, which will be sourced increasingly more from in-state farmers like Grazul because of Cuomo’s legislation. With these factors considered, the time was right for Grazul to get into the business. Once he entered the hops business, Grazul began his run of trial and error. From stringing up his vines with rope instead of twine to using sheep instead of hands to clear weeds, Grazul has found ways to make his business more efficient. Grazul found that the biggest business advantage about hops farming doesn’t lie in efficient farming practices, but in the biological makeup of the plant itself. The rhizome structure of the hop makes it a cost-effective plant to produce. He has used this technique and money from sales to grow his crop immensely. Even though his business is expanding, Grazul said the stress of the business end doesn’t compare to the joy of getting down and dirty, working with his hands and raising the plants from the ground up. Mudrak said he can see the energy and passion for hops that Grazul has in the quality of his work. After pairing up on last year’s Harvest Ale, Mudrak said he was glad to be able to work with Grazul on this year’s batch. The beer debuted Wednesday at the pub and a lederhosen-clad Grazul was there with some of his finest hops to teach thirsty patrons how the beer was made. People filed into Bandwagon and the Harvest Ale was one of the most popular items on the menu. Senior Reeve Moir said that it was one of the smoothest beers he has ever tasted.